By team rankings and by average recruit rating and by upper-level talent and eyeball-testing and whatever else one might judge these things by, Nebraska's 2019 recruiting class looks like it might just be one of the best in years. Back in December, during the early signing period, head coach Scott Frost raved about the collective winning mentality of this incoming 2019 class. I wrote a story about just how much winning the incoming recruits had done and how, over a four-year period, no other class had as many kids playing in high stakes games with state titles on the line. There was reason for optimism then, before the class was even wrapped up. And, as this class has come together and the Huskers have added a few more pieces, the optimism has only grown. “I don’t know if I have seen an incoming class in my career that has me as excited [as this one],” Frost said on National Signing Day. 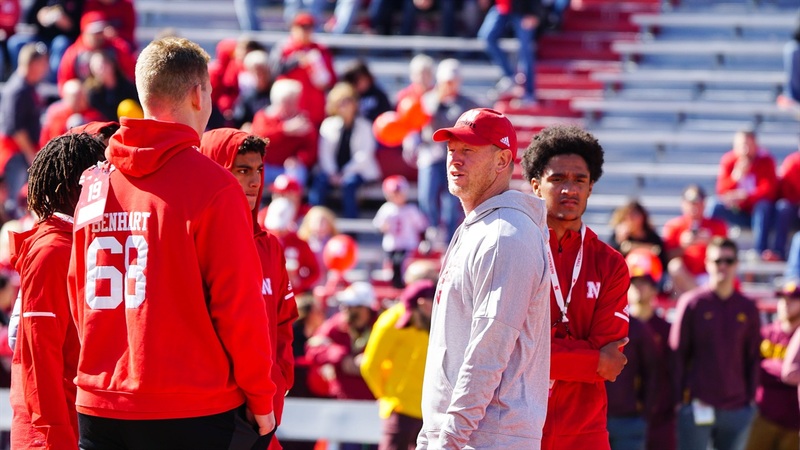 Asked who he could see becoming a leader of the class, Frost said “almost every single one.” This coaching staff, in the short time they’ve been in Lincoln, has prided itself on taking kids who not only have top-end talent but also have good character. The character part is hard to quantify (though you know it when you see it, and you see it when talking with the members of Frost’s first two classes), but the talent part, at least as predictive metrics go, that’s a bit easier to quantify. And the talent of this class is as good as Nebraska’s seen in a while. Here’s how the Huskers have measured up by simply looking at the last five years of recruiting rankings from each of the three major outlets. The Huskers have hit a five-year high (or, I guess, low?) across all three outlets under Frost. But I think most people would naturally expect that if they’ve been inundated with Husker talk over the last year. This 2019 class probably has the most fanfare of any class in a while. There are presumed stars in the making (Wandale Robinson, Bryce Benhart), hometown hero-types (Nick Henrich, Garrett Nelson) and sleeper picks the media at large is enthralled with (Jackson Hannah). Rating-wise, the excitement makes sense. Both by 247Sports’ metric and Rivals’ rankings, Frost’s second full recruiting cycle represented the highest-rated, on average, class in a while. For Rivals, the average star ranking was the highest since the 2011 class. For 247, the 2019 bunch had the best average rating since the ratings began in 1999. The number of 4-star recruits was at a six-year high in the 247Sports database and an eight-year high in the Rivals database. The classes are getting better, by Nebraska’s standards. Even without adding national context to the discussion, that simple fact should be reason for excitement. Mike Riley’s 2017 class represented his best recruiting effort at Nebraska and, at the time, one of the best-looking classes in a while. It was built on the heels of a 9-4 season. There were tangible results to be shown. Now, we all know what happened to the 2017 class; that’s not the point of bringing it up. The real point is look at what Frost has had to sell in his two full cycles on the recruiting trail: 8-16 over two years, the worst start in program history, national voices laughing at the program and rivals reveling in Nebraska’s misfortune. And the Huskers have still been on fire on the recruiting trail. Plus, there has been only one de-commitment of a player who committed to this current staff (and that was a special situation). When they have set their sights on guys, they haven’t missed often and they haven’t seen any wavering. So, adding national rankings into the equation and considering the Huskers are already recruiting at a top-20 level, the optimism over this class starts looking almost muted. How much talent does it take to win a national title? Typically a team has to be a top-12 (or so) recruiter. … How much talent does it take to get a shot at a national title? I would say Nebraska has already hit that threshold. It's in the group, but … Nebraska is still on the fringes of that group. It's important for the Huskers that they build on the 2019 class. If Nebraska is higher in these rankings a year from now, that should be viewed as a significant gain. The wild card in all of this recruiting talk is winning. What happens when Nebraska starts actually winning football games? If Frost and company are able to go into Kentucky with a 4-8 record and pull the best recruit that state has seen in years away from a 10-3 Wildcats team, what does that say about their ability to walk into SEC country a year from now with, say, an 8-4 record? What’s the ceiling then? What about in two years if and when things are truly ramped up? It’s a double-edged sword. You need to recruit well to win, but you need to win enough to recruit well. Nebraska managed to nail down the recruiting part without the on-field results, meaning the on-field results should start coming pretty soon. This class (and don’t forget the class before in all this) could very well be the group that gets the ball rolling.